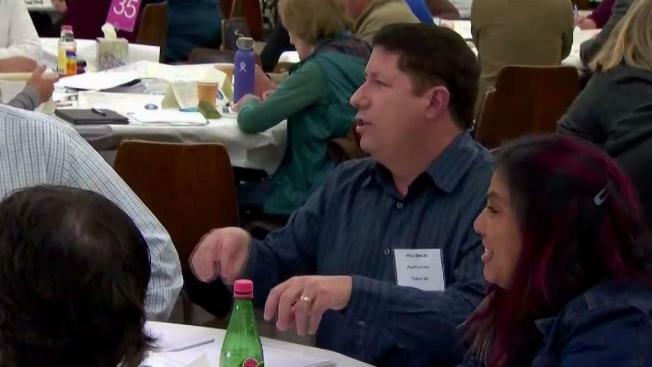 Dozens of people with a wide range of opinions on guns met at the Santa Clara County Fairgrounds in San Jose Saturday for the first even summit on firearms and safety. Christie Smith reports. Dozens of people with a wide range of opinions on guns met at the Santa Clara County Fairgrounds in San Jose Saturday for the first-ever summit on firearms and safety. The event was set up to open up a fair and balanced discussion on firearms and to hopefully find a common ground. "Guns are so prevalent and so easily obtained that they've created the bad social conditions," said Ann Duwe from Los Altos. Other attendees, like Will Bailey, say they think the root caused to all types of violence need to be explored. "I'm a strong supporter of the second amendment," Bailey said. "I don't believe that adding more laws placing the burden on law abiding citizens is going to solve these issues." The event covered issues like school safety, gun violence and suicide prevention. "The communication has been so broken in the issue around firearms violence has so polarized people aren’t even talking about basic commonalities," said Supervisor Dave Cortese, who helped organize the event. The crowd included a few high school seniors whose voices have grown louder with school walkouts and activism. "Our group was talking about how us student should have a summit like this coming from all different school or even just our school," said student Brianna Williams.